Hard Drive Capacity 1TB. Platform Microsoft Xbox One. Model Xbox One S. Design/Finish Plain. Region Code PAL. Modified Item No. About this product. Experience great console exclusives, such as Gears of War 4, Halo Wars 2, Crackdown 3, as well as all the main franchises this year, such as Battlefield 1, Madden NFL17, Titanfall 2. Xbox One S is a console with 4K Blu-ray, 4K video streaming, and HDR. 6 mo. warranty! BEST VALUE ON EBAY! 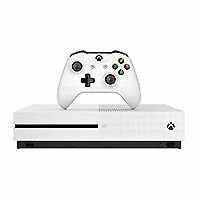 Microsoft Xbox One S 1TB White Gaming Console. - Microsoft Xbox One Console Manual. - Microsoft High Speed HDMI Cable. Stream 4K video on Netflix and Amazon Video, and watch UHD Blu-ray movies in stunning visual fidelity. With all the biggest blockbusters this year, everything you love about Xbox 360 is even better on Xbox One. Microsoft Xbox One Console Manual. With a 4K UHD Blu-ray Disc player, the Xbox One X can play UHD Blu-ray Discs. The Xbox One X features an HDMI 1.4b input and an HDMI 2.0b output. It also has three USB 3.0 ports as well as an IR out port. 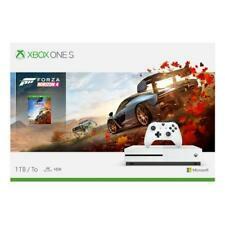 Microsoft Xbox ONE 500 GB. Works on Xbox Live! WE WILL NOT CHANGE THE VALUE OF THE ITEM FOR CUSTOM PURPOSES. 500 GB Hard Drive. 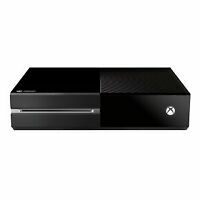 Microsoft Xbox One Console 500GB Black. Each individual unit has been tested and is fully functional. What's Included:-Xbox. We will take care of any problems that may arise. Light scratches and wear from normal use. 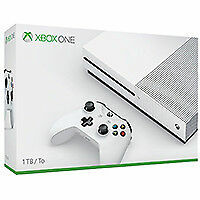 XBOX ONE S 1TB Console. - Instruction manual. Order Now! - HDMI cable. Play on the world’s most powerful console. Experience 40% more power than any other console. – Daily Star (UK). Trending at $432.49eBay determines this price through a machine learned model of the product's sale prices within the last 90 days. Refurbished console in Good condition. HDMI Cable. 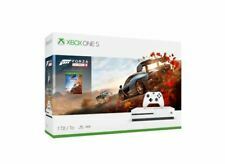 Forza Limited Edition 1 TB Xbox One Console, Blue. Trending at $254.99eBay determines this price through a machine learned model of the product's sale prices within the last 90 days. 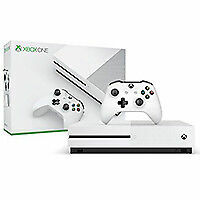 Microsoft Xbox One S 2tb BUNDLE (upgraded with Firecuda sshd) White Console. Condition is Seller refurbished. Shipped with USPS Priority Mail. Microsoft, 234-00703. As an industry leader in product sourcing and reconditioning, we are expert in providing the best and finest quality products. We proudly stand behind the quality of our products. Model No. 1681. 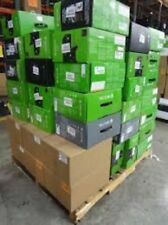 XBOX ONE NEW IN BOX. New Unopened. NEW & Factory sealed. We always solve the issue on your side. Kinect Sensor Bar for Xbox One. Refurbished console in Good condition. HDMI Cable. Take on the best in the world on Xbox Live, and play as your favorite NBA all-stars as you alley-oop for a win. Play against NBA 2K19 players across the world on Xbox Live. Data Storage Drive Capacity: 1TB Hard Drive Capacity. DOES NOT COME IN ITS ORIGINAL BOX.....GUARANTEED TO WORK!!!!!!! !in PERFECT CONDITION!!!!! 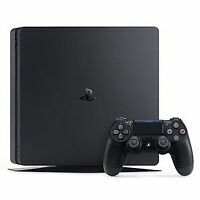 !Comes with a controller w/2 rechargeable batteries after market brand, Battlefield 5 in PERFECT CONDITION, charging cable, HDMI CORD and power cord!!!!! 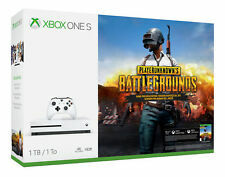 Own the Xbox One S Fortnite Bundle and battle to be the last one standing. Download of Fortnite Battle Royale. 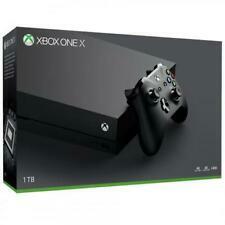 Xbox One console includes 4K Blu-ray playerand 4K video streaming. 1-month Xbox Live Gold trial. XBOX ONE X 1TB. Monitor in images is not included. The monitor was used for demonstration purposes to show that the console is actually functional. In good condition. It has a few minor scratches on the top part. 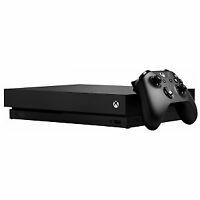 Microsoft Xbox One 1TB Black Model 1540 Console ONLY. Condition is Used. Console is in working condition. Console comes with box only. No cords or controllers included. Free shipping. Trending at $218.33eBay determines this price through a machine learned model of the product's sale prices within the last 90 days. 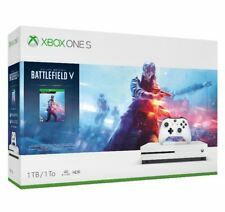 Includes Xbox One S 1TB console, Xbox One controller, power cable, HDMI cable and original box. Game is not included in this bundle. Everything is in perfect working order. Observe smoother interactions to your gaming with Xbox One’s 8-core custom CPU (1.75GHz). Play bigger and immersive worlds. Its 8 GB DDR3 of graphic memory lets you explore bigger worlds and execute action-packed missions at quicker load times and with more realistic details. HD audio and video play. Use your Xbox One to play Blu-Ray music and movie CDs. There’s no need to buy and set-up a separate player. Don’t worry about unfinished games. Your Xbox lets you continue gameplays where you left off. Microsoft got me again for another Xbox One. This time a One X. I bought a Xbox One for Forza 5, sold both on craigslist 2 days later. Bought another and Forza 6 at its release, and sold both in under a week. Im keeping this one. However there are things I dont like. MAIN dislike is the OS and home menu layout. Even the 360 has better menu functionality. Forza 7 'gameplay' still doesnt match Forza 4, but its better than 5 or 6 by alot. Visually tho its amazing. The other dislike of the One X is possibly my own fault due to expectations of a 500 dollar console, but everything the One X does requires alot of waiting. I get that the games are massive compaired to anything previously, but load screens take several mins depending on the game. Also the days of buying a new game, putting it in and playing it are over. It goes like this. Open game, insert game, find something to do for next Hr or so. For example Forza 7 loads 32GB from the disk, and downloads Another 64GB before install is complete. Fiber Optic internet is your friend. I have gigabit fiber, but on game release night it might as well be dial-up since every one that bought game is also downloading the 64GB update. All in all, system is amazing graphically, so much so that overlooking the dislikes is justified. Last thing to consider, is buy a 8 or 10TB NAS or at a minimum a 4TB external hdd. After system configuration your down to 700GB , and with games ranging from 60-100GB each theres not nearly an adequate amount of storage. If you record and save any 4k game play its drops that storage space at almost a 100MB a second. Lastly, if you own a One S already, save your money. I have been an xbox player for approximately 6 or 7 years now. I tend to hang back and let others be the first to spend their money on `the latest and greatest` until a lot of the bugs are worked out and the prices drop. I had held back long enough that my gaming buddy and I were the last in our bunch to upgrade. 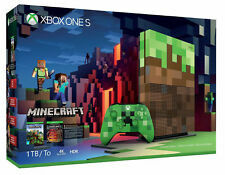 When my husband and her family asked us what we wanted for Christmas we told them we wanted the xbox one minecraft bundle., We are both getting used to the new system, in many ways it is more confusing to find things on, but in other ways is also easier. It appears to be a good solid system and I have yet to find any real problems with the system itself., My main advice to someone just switching over is to be prepared for some major differences. I used mine for tv watching, internet surfing, bill paying, in short it was also used as my computer as well as my gaming system. In time I will probably use the new one much the same as I learn my way around it., The graphics are great, the gaming interaction is great, I love the faster processing time cutting down on lag in games and videos. The controller size is slightly different but not enough to make it hard to adapt to., I would recommend the new user watch any training videos they find for help in learning to navigate, especially if like me they use their xbox for more than just gaming. 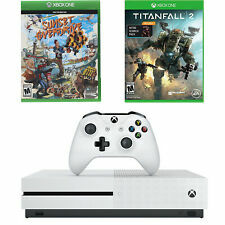 I have been using mine a week now and there are still a few things I haven't figured out how to do on this new one yet, but once I figure it out then I will feel more comfortable with the final full switch over., Please make note: When buying a new xbox 360 you would get a headset with it. The xbox one s does NOT come with a headset, so you will also need to purchase one., One thing I DO like about the new system is the way that my xbox gold now includes my husband on the few times I can convince him to join me gaming. Maybe some day I can get him feeling confident enough to play some COD with my partner and other friends., All in all, the overall feel of the xbox one s is a compact, well-designed system. I bought a 360 about 18 months ago and still had space left on it. Didn't need to upgrade. Didn't plan to upgrade. But I "accidentally" found this on sale for $229 and since it came with the kinect sensor and 3 games I decided to invest in it. At first I found it really hard to navigate and I also found that the "font size" on the dash and in game menus is much smaller than it was on the 360. That may not be a problem for people in their teens and 20's but I'm in my late 40's and my eye site isn't what it used to be. After several calls to tech support and message forum posts, I learned that the only two options for increasing the on-screen writing is my using a temporary magnifier that doesn't allow you to select items when magnified, or by using a narrator who reads EVERY SINGLE THING to you and that gets annoying real fast. My only solution was to buy a larger TV. So I went from a 37 inch screen to a 48 inch and I can comfortably read the dashboard menus, however some in-game items are still a little challenging depending on the maker of the game and type of item., , What I like about the Xbox most is the voice control options. It's pretty cool to just say, "Xbox On!" and the Xbox turns on, then it turns on my Kinect, my TV, and my Controller. I can tell it (with my voice) which programs to open or close, I can say "pause" and it will pause netflix for example, I can say "play" and it will play the show again.. I can also fast forward and rewind with my voice as well. I love this function. I also feel compelled to tell it "thank you" after it performs these functions for me but it doesn't acknowledge courtesy. lol, , I love the versatility of the Xbox One as well. You can watch TV on it, though I haven't yet because my antenna is connected to my Tivo and my Xbox 360 is connected to my Xbox One so I just watch TV on a different input/source. But it has all the streaming apps, it plays blurays, it plays games... it's a one stop shop., , Another downside is the game store. I liked the way the 360 broke things down by genre and it was a lot easier to find what I was looking for. I find this game store to be more challenging to navigate. Plus there's the game store, the game hub, and my games and apps, plus there are homescreen game pin areas.. it's a bit confusing to me. Too many places to get lost in., , Overall, I don't regret the purchase.. it was an excellent value for the price I paid and I'm sure I'll learn more as I go. Received the unit few days back. Everything works perfect. Here the Pros & Cons., Pros, + Kinect : Easy to control XBox and TV with voice. The Dance / Fitness games are fun. Practicing Fantasia (got from Library) / Lets Dance 2014 (bought from BBuy)., + Hi-Fi Games : Games are so refined and next level in Graphics/FX. Trying to Play F1 2015. It takes time for newbies. Have to try the Top Rated Games (Halo 5, Just Cause, Gears of War, Tomb Raider). Am too a Beginner., + Smart TV Apps : If you have Non-Smart TV then this will make your TV Smart (NetFlix, HBO Go, you name it. )., + One Drive : I have lot of media on my One Drive. XBox fetches the content with my live id. Watching Photos with controller is awesome. Especially Zoom and Pan the images via RT, LT., + Blu-Ray : XBox can play Bluray discs. Need to install Bluray app. It's Free., + Free Games : Xbox has couple of free games on App store. I really like "Airmech Arena". It's online only game. But very good to play., + Design: The console design/Matte finish is great. Has plenty of vents for air flow. Fits well on my TV stand., + 360 games : MS released patch to play old 360 Games on XBox one. At present it has couple of games. Expecting MS will release more by 2016., + Motion Feedback : MS fixed rotors inside Game controller for players to feel motion feedback. It's fun when playing Race Games like F1, NFS., , Cons, - Time to setup : It took more than 20 minutes to setup for the first time. It downloads over 2 GB firmware update for XBox, Kinect and Controller., - Controller pair : At first the controller didn't get pair and xbox light was blinking for sometime. Then I searched for solution on google. Had to press the pair button on XBox console (on side above USB Port) and press Pair button on front side of controller. If you are familiar with XBox then it's not an issue., - Power Brick : Not sure why the Power brick is really designed like Brick. It's so heavy and huge. Does it have internal fan to cool the circuits? :), - Cables : The XBox Power cable and Kinect cable are so thick. For me, it's bit difficult to fit/hide in my TV stand. It's not big deal for many., + Free Space : 500 GB model shows 364.9 GB for Apps and Games. (Refer attached screenshot.) Installed 2 games and it took 36 GB. It's not a big deal. I still have plenty of storage left. If I used all, will attach my 2 TB Portable HDD., , Overall I like it very much and recommend to those who looking for Gaming + Media Center console. While it does look nice, and attaches to the x-box with a bit of finagling, my unit burned out the existing 1tb external drive that I had been using. I figured it could have just been a bad drive as it was 2 years old. I bought a new 2tb Seagate drive, which worked for about 2 hours, then died. Neither drive was salvageable. Could have been a defective enclosure, or just a bad design, but I won't risk another drive. I am not going to say there is any kind of problem with the game system as a whole since this is not an issue. However, I was unable to register for and receive a Microsoft Live account which is required to use this system until I registered for and got a Microsoft email address. Several days passed where I could not access and play this system because they would not send an email to my non-Microsoft email address. This will be my last Microsoft system. we were never told at purchase time that you had to have an internet to play this system or install the games. My grandson does not have internet or even wy-fy at his mothers house. we tried to install it at my house and it started to install but when we went back to his house for them to play, it would not play again! Needless to say we are very very disappointed and my husband is so angry at microsoft for overly complicating an x-box game system/ When our children were small and had a PS 2 it was just fine. Since the "New Xbox Experience" update in Fall of 2015 the Kinect has essentially become useless. The swipe navigation is no longer a thing for the Xbox user interface and the voice recognition is terrible. It takes me longer to tell it what to do that to just use the controller for navigation., , I can't speak for it's accuracy in games since I do not own any Kinect enabled games. But I can say that I had high hopes when I first got it for changing and streamlining my Xbox One experience but that has most certainly not been the case., , I do not recommend anybody purchase one of these. It's only redeeming factor is that you can use it as a microphone for online chat, but even then the Xbox comes with a headset so the point is moot. I had a Xbox 360 and was expecting the same user friendly experience but everything I have tired to do has been difficult. First it has to install every game you buy. Even on a disk so that means waiting every time you buy a game. Your suppose to be able to play from your computer but after trying for an hour I gave up. I had a Wii U before this and wish I would have just stuck with that. Only buy if your wanting a flashy hunk of junk that will give you problem when it's brand new. I have already had to reset stuff and had it not want to connect to the Internet. I bought it for the few games I wanted that weren't on Wii U but I should have gone without. The Xbox One is the third major video-game console developed by Microsoft. 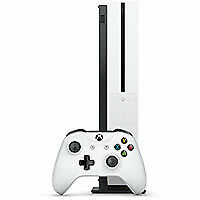 First released in November 2013, the Xbox One emphasizes online play, social networking, and cloud-computing features. The console has a library of more than a thousand games, including the titles Madden NFL, Halo 5, and Call of Duty: Black Ops III. 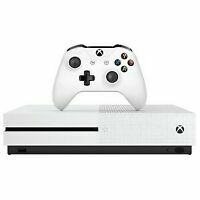 The Microsoft Xbox One S bundle is a slight variation of the original Xbox One design. 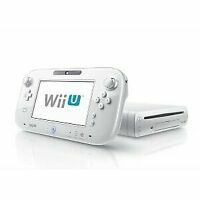 The console features a 40% smaller case, and it can be set at a vertical orientation. The Xbox One S also supports both 4K-resolution and HDR gaming. This results in a superior picture quality, but it only works on compatible television sets or monitors that support 4K and HDR technology. Games that output in 1080p can be upscaled to 4K resolution. The Xbox One X is the second update to the Xbox One design. First released in November 2017, the One X features significantly improved power and performance. Games marketed specifically as Xbox One X Enhanced are designed from the ground up to take advantage of the improved power of the One X console and controller. These games are still compatible with Xbox One and Xbox One S hardware, but when played on the One X console, they will receive major graphical improvements that aren't possible on the older hardware. In addition, the One X console confers significant performance improvements to existing Xbox One games such as a higher resolution or more stable frame rate. Yes, it is backwards compatible but only with select games. Microsoft is constantly adding games to the list of backwards compatible titles, so you should check it often. Backwards compatibility confers several graphical enhancements on Xbox 360 games, including a more stable frame rate, improved texture filtering, and a more consistent resolution for games with dynamic resolutions. The original Xbox One comes with either a 500 GB internal hard drive or a 1 TB hard drive. 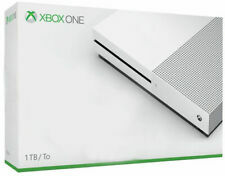 The Xbox One S offers both 500 GB and 1 TB models as well as an additional 2 TB version. The Xbox One X console will launch with just a 1 TB model. In addition, the total storage space can be expanded with an external hard drive or solid-state drive. This external drive must support USB 3.0 connectivity and be at least 256GB in size.